Three platforms earn Leader status while Coursera tops overall satisfaction ratings. 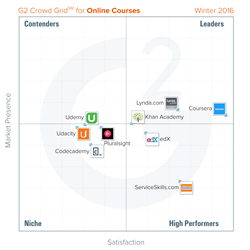 G2 Crowd, the world’s leading business software review platform, today released the Winter 2016 Online Courses Software Grid report to help businesses make the best online courses technology decision. Coursera, Lynda.com, and Khan Academy were named Leaders in the report, receiving strong customer satisfaction scores with a large market presence. edX and ServiceSkills.com were named High Performers in the report, earning strong customer satisfaction marks with smaller market presence scores. Coursera earned the highest overall satisfaction score, while Lynda.com earned the highest overall market presence scores. The Grid leverages customer satisfaction data reported by authenticated users along with vendor market presence determined from social and public data. Based on a combination of these scores, each software solution is categorized as a Leader, High Performer, Contender, or Niche. High Customer Satisfaction - NPS scores for online courses products were high, with the average NPS score of +65 indicating positive customer satisfaction. Course Quality vs. Affordability - Reviewers for each online courses product indicated that the deciding factor for which platform they chose was the quality of the courses offered rather than the price. Mobile Usability - Seven of the nine online courses products have mobile applications in addition to their web applications, demonstrating the role of cross-platform accessibility in online courses. Of the roughly 38 products listed in G2 Crowd’s fundraising category, the ranked products each received ten or more reviews to qualify for inclusion on the Grid. G2 Crowd, the world’s leading business software review platform, leverages more than 60,000 user reviews to drive better purchasing decisions. Technology buyers, investors, and analysts use the site to compare and select the best software based on peer reviews and synthesized social data. Monthly more than a half-million people visit G2 Crowd’s site. Co-founded by the founder and former executives from SaaS leader BigMachines and backed by roughly $12 million in capital, G2 Crowd aims to bring authenticity and transparency to business technology research. For more information, go to G2Crowd.com.